Freddie Mac reported that it has already exceeded the 2016 goal for reducing its mortgage-related investments portfolio only a third of the way through the month, according to Freddie Mac’s April 2016 Monthly Volume Summary  released this week. The mortgage-related investments portfolio for Freddie Mac contracted at an annual rate of 22.4 percent in April (which calculates to an over-the-month decline of about $6.4 billion). The contraction left the aggregate unpaid principal balance of the portfolio at $333.5 billion as of the end of April, which is nearly $6 billion lower than the 2016 cap of $339.3 billion , which is the amount the portfolio must reach by the end of the year as part of its required reduction. Freddie Mac’s fellow GSE, Fannie Mae, met its year-end goal for reducing its mortgage portfolio last month. The value of Freddie Mac’s mortgage-related investments portfolio has declined by approximately $72 billion since the end of March 2015, when the aggregate UPB of the portfolio was $405.6 billion. For the first four months of 2015, the portfolio has contracted at an average rate of 11.6 percent and has contracted in all but two of the last 13 months (December and January). Freddie Mac’s single-family refinance-loan purchase and guarantee volume for April was $14.9 billion, which represented 57 percent of total single-family mortgage portfolio purchases or issuances during the month. 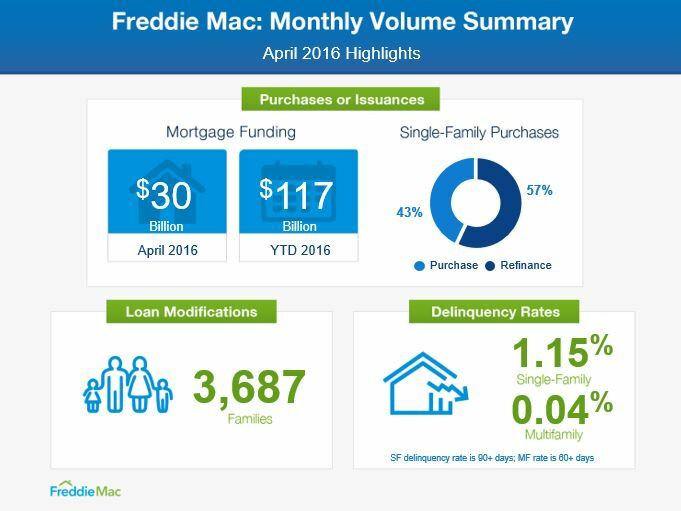 Relief refinance mortgages comprised about 8 percent of Freddie Mac’s total single-family refinance volume in April. The serious delinquency rate on mortgages backed by Freddie Mac declined by another 5 basis points from March to April, down to 1.15 percent. The number of loan modifications completed on Freddie Mac-backed loans totaled 3,687 in April, which brings the year-to-date total (as of April 30) up to 14,597. 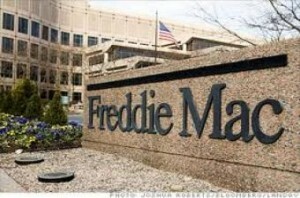 Freddie Mac reported a net loss of $354 million in the first quarter, which was its second in the last three quarters. The reduction of the mortgage portfolio and the wind-down of the GSEs’ capital buffer, which is required to be at zero by January 1, 2018, is likely to result in more calls for GSE reform as the Obama Administration draws to a close. Click here to view the complete April Monthly Volume Summary .